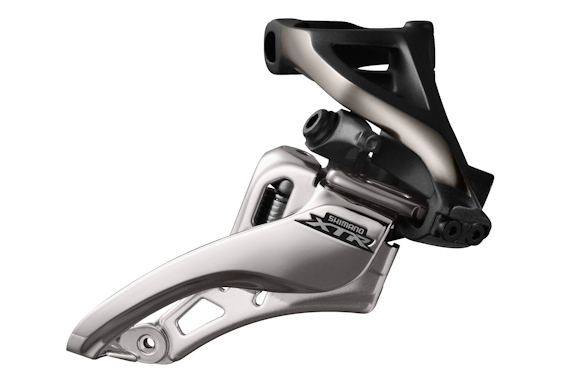 Dalle pagine di Bicyle Times Magazine la presentazione del gruppo Shimano XTR per le mountain bike del 2015. Tra le tante e ghiotte novità una su tutte: finalmente il colosso giapponese propone la trasmissione 1×11! 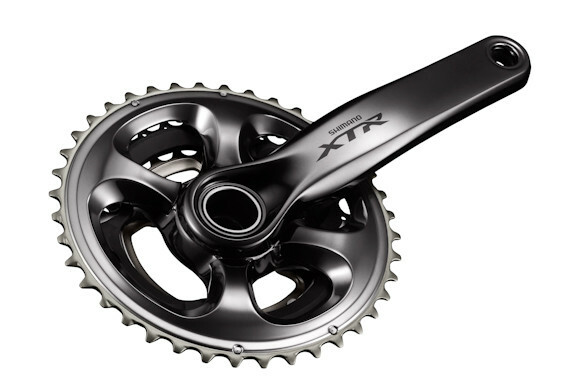 It was time for a new XTR, and with the introduction of single chainring groups from SRAM knocking at the door of the premier mountain bike component group, Shimano was facing a serious challenger. 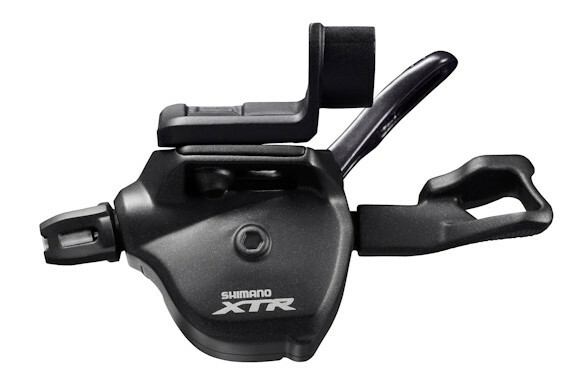 When the press gathered a few weeks ago at Shimano’s U.S. headquarters in Irvine, Calif., we were aware of the basics, now it was time to hear the how and why of the new XTR. First, the new group will have two distinct flavors: Race and Trail, to better adapt to different riding specialities. After all, a pro-level enduro racer has very different needs than a World Cup XC racer. The underlying philosophy is “rhythm and range”, with the smaller steps between cogs allowing riders to better maintain cadence and the extended range of a 40-tooth cassette. The most noticeable change for the new XTR the jump to an 11 speed cassette, with a range of 11-40 being the only one offered. Actual cogs are: 11-12-15-17-19-21-24-27-31-35-40, with an aluminum 40 tooth cog, titanium through the middle, and steel for the last few cogs. All this is attached to a carbon fiber spider and will slide onto a standard Shimano-splined cassette body. To go with the new cassette is a new chain. The plates are asymmetric to aid shifting, and use a new SIL-TEC surface treatment. SIL-TEC is a super-slick plating process that should keep the ride quiet, the chain wearing longer, and even sheds mud better than previous surface treatments. The crank uses a single spider to handle either a single, double or triple chainring configuration. The spider is a new proprietary asymmetric pattern designed to be stiffest in the part of the pedal stroke when the most torque is applied. This idea comes from Shimano’s high end road group, Dura Ace, and was developed using data from its new bike fitting system, bikefitting.com. Chainrings are a combination of materials, with titanium, carbon fiber and aluminum in the mix. The triple has a single gearing option, with a 40-30-22 tooth range. There is a choice of three doubles: 38-28, 36-26, 34-24) and the single ring setup has 30, 32, 34, and 36 tooth options. The single rings have tall and wide “chisel” shaped teeth that claim to eliminate the need for a chain guide on all but the roughest terrain. There are two versions of the crank, Race and Trail. The Race crank has a narrow 158mm Q-factor (for single ring, 168mm for double) and use a 3D bonded hollow non-driveside crank arm. 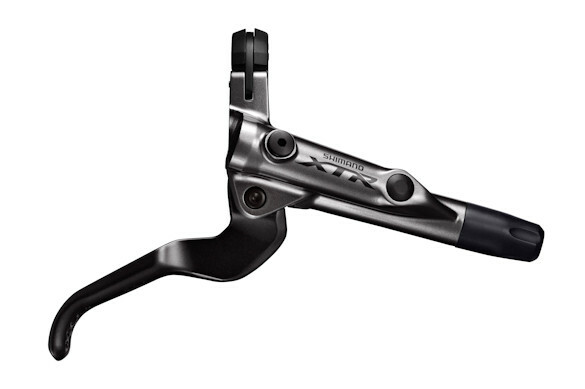 This bonding is a new technology for Shimano, and creates a lighter and stiffer arm.The Trail crank uses a hollow cold forged non-driveside crank arm, which is stronger and more durable than the bonded arm. The 168mm Q-factor is used for all three chainring configurations. Shimano claims the new group offers a 20 percent reduction in shift effort, and the “most responsive mechanical shifting”. The new shifters utilize ball bearings and a polymer-coated cable to reduce shift effort, and the indexing offers more pronounced feedback. 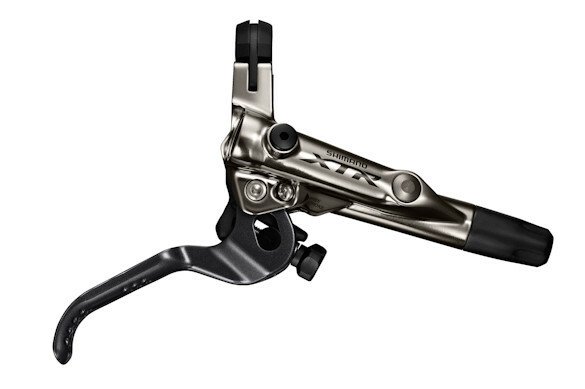 The shifters integrate with the brake levers using a new I-spec II mounting system. The levers are carbon fiber and the cable release lever is reshaped with a wider more textured surface. 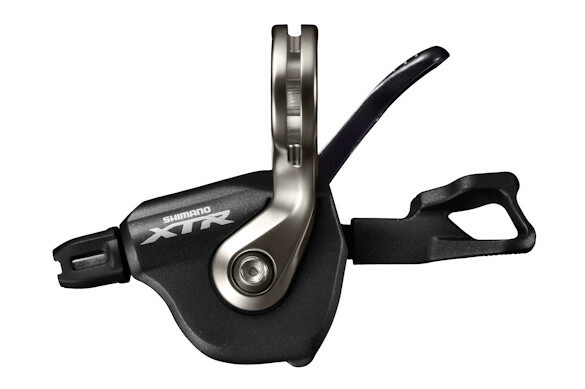 An entirely new design, Shimano claims its Side Swing front derailleur has a 100 percent increase in shifting performance. 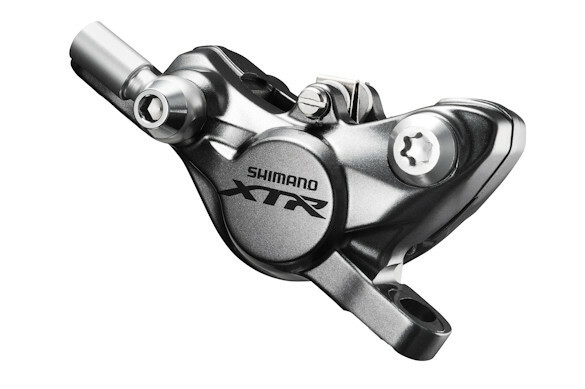 We’ve been happy with Shimano front shifting in the past, so the other issues it addresses are more interesting. The Side-Swing design routes the cable across the top of the derailleur, moving the linkage away from the crowded area by the tire. This saves 15mm of space, which could have a noticeable effect on chainstay length and mud clearance. 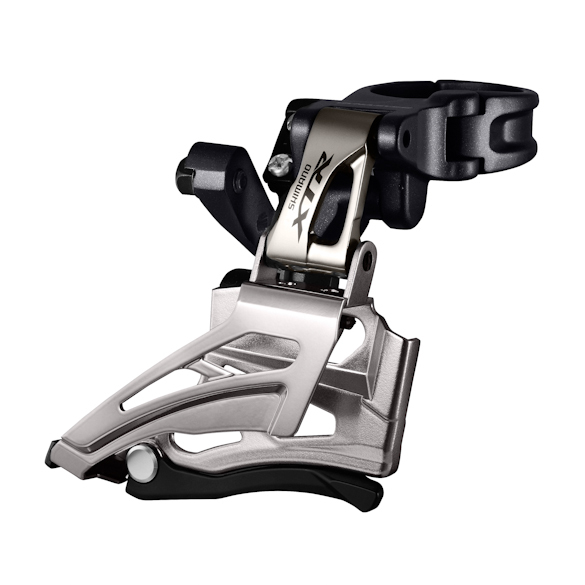 The Side Swing derailleur will come in double or triple versions, with high clamp, low clamp, D-type and E-type mounts. A conventional double increases shifting performance by 50 percent and is available in high clamp and low clamp options. The cable routing seems like it would work fine with most down tube routed cables, but top tube mounted (and internally routed) cables are going end up resorting to zip-ties. 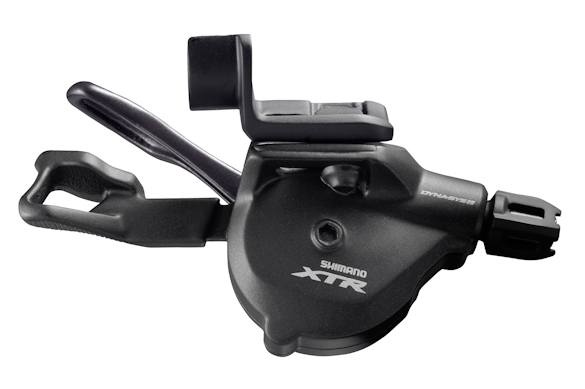 Standard derailleurs in the normal mountings and cable routings will still be available, but we expect this design to become the dominant spec in the future, assuming Shimano eventually brings it down to lower price points. The 11-speed rear derailleur carries over the technology from the 10 speed group with some tweaks and improvements. 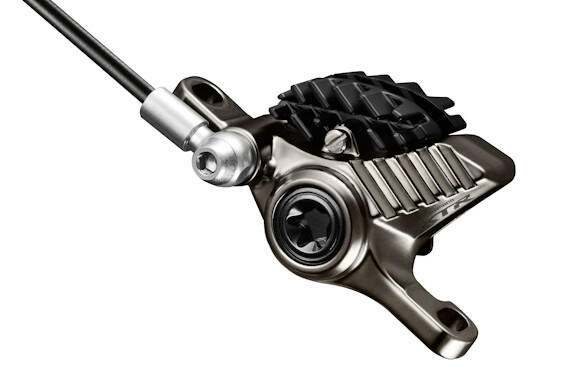 The Shadow Plus clutch has a wider range of adjustment, with a easily access external bolt to change the tension. This should allow riders to tune the clutch to the terrain: less tension for smooth trails, more tension for the gnar days. The Shadow low-profile design is even more low-profile, protecting what promises to be a very expensive part from damage. The slant angle of the linkage is changed as well, to lower shift effort and keep the chain tracking on the new wide range cassette. There will be two cage lengths offered, GS (mid-cage) and SGS (long cage), and both can be used on any XTR chainring set up single, double, or triple. 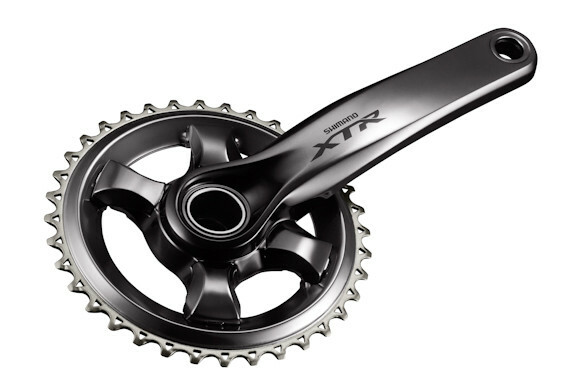 The XTR drivetrain was already top notch, which really leaves us with one question: Will the 11-40 cassette offer enough range to compete with the 10-42 SRAM offering? Three teeth may not seem like much, but time will tell if loosing a gear off the top and bottom to keep more consistent jumps between gears is what the 1x market is after. For dual ring set ups, the 11speed cassette allows for smaller 10t jumps between gears while not losing any gear range, something I thing most riders are going to like, both for improved shifting performance, and an easier time finding the right gear at the right time. The triple option is there for riders who want it, but we bet it is going to be a tiny part of the sales, both aftermarket and as original equipment on new bikes. Already regarded as some of the most reliable and powerful brakes on the market, the Race and Trail brakes return with a few tweaks to improve performance. The Race brakes are lighter, with a magnesium caliper and master cylinder. The Trail brakes have a new Servo-Wave carbon-aluminum lever. The Trail brakes still come with the finned Ice Tech pads. Both brakes use an insulated piston (Shimano uses the term “glass fiber phenolic”), and a new pad coating for 10 precent more heat resistance. The bar clamps are slimmer, and pair up with shifters using the new I-Spec II mentioned above. Rotors now come in a 140mm option with a smaller (and lighter) aluminum spider, joining the 160mm, 180mm, and 203mm sizes. The Frezza technology remains, with a claimed 50 degrees Celsius reduction in heat compared to standard all steel rotors. 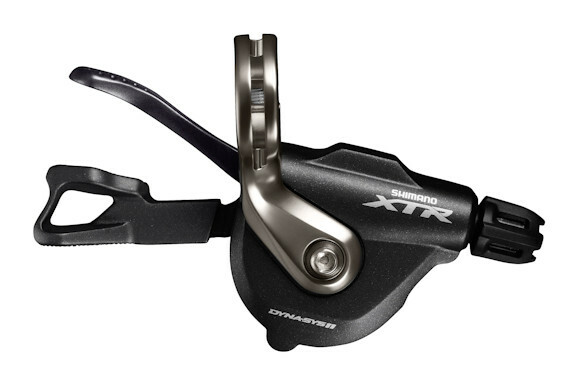 Shimano has been killing it with brakes, and some minor changes should only make these better. Shimano’s wheel systems have long been regarded as sturdy and reliable, but not very flashy and behind the times a bit in regards to rim width. The new Race and Trail UST wheels should change those perceptions. Again, using technology developed on the road side of the business, these wheels use a carbon laminate rim. The bead seats are aluminum with carbon fiber creating the rest of the structure. Aluminum is a great material for bead hooks, as it is easier to maintain tolerances, and carbon can be made very light, stiff and strong for the rest of the rim. 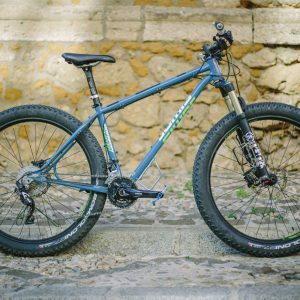 The hubs are Centerlock only, and there are 28 butted spokes front and rear for both sizes available, 27.5 and 29 inch. No more 26 inch wheels from Shimano. The Race wheels’ rims are 23.9mm outer width, 20mm inner width. The Trail wheel gets a 27.mmm outer, 24mm inner. Both wheels use a new lighter bearing and axle system. We are curious about what Shimano changed here, and the threaded axle/cup and cone bearings has been a Shimano trademark for decades, but so far, no specifics have been released. For those looking for the ultimate in XC race wheels, the carbon tubular race wheels are still in the line up. I’m not sure who is riding these outside the pro race classes during XC events with tech support stations, but there must be a market, or Shimano wouldn’t make them. 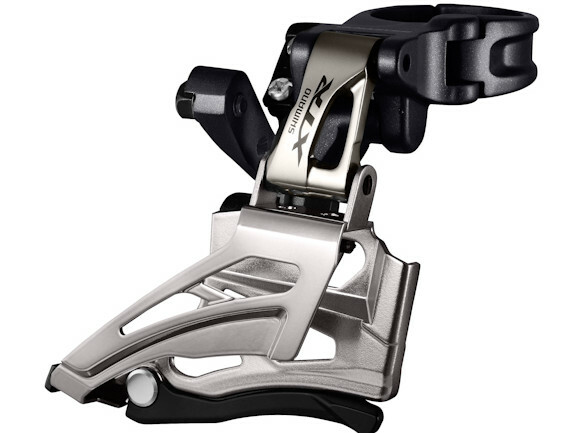 The 2015 Trail and Race pedals have new model numbers, but little other info has been released. These are considered the 25th anniversary pedals, which makes SPDs only a year younger than Dirt Rag. Vero! Bisogna anche riconoscere lo sforzo che Shimano sta facendo da alcune stagioni a questa parte, col miglioramento costante in ogni segmento di gamma.